2. Discard bay leaf. 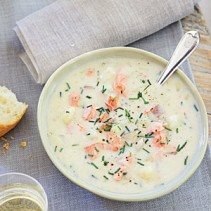 Stir in cream, 2 tablespoons chives, vinegar, and next 3 ingredients. Cook over medium heat, stirring often, 2 minutes or until thoroughly heated. (Do not boil.) Ladle into bowls; sprinkle with remaining 2 tablespoons chives.